Please refer this table for the required user role for the corresponding installation steps. 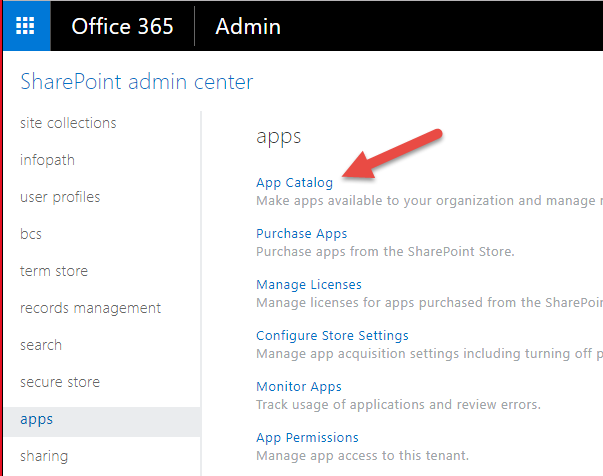 SharePoint Tenant Administrator Create App Catalog for your SharePoint tenant. It is likely that App Catalog site already exists if you have installed other Apps. Approve App installation request from the App Catalog. 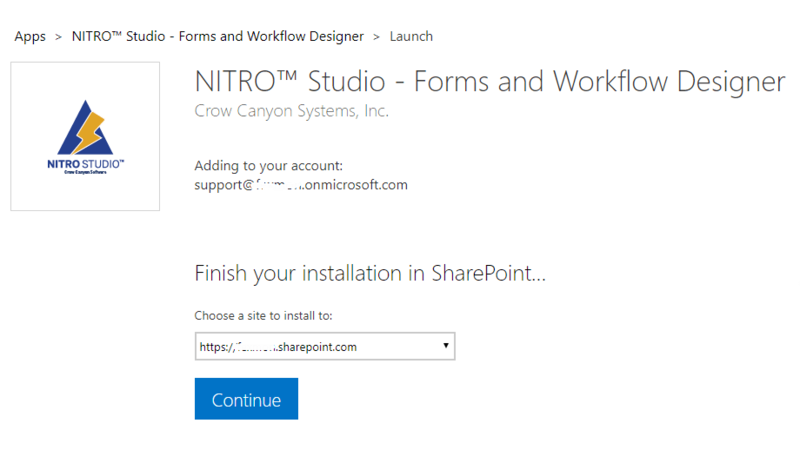 Site Collection Administrator Install app “Crow Canyon NITRO Studio” from SharePoint App Store. Please refer detailed steps to install these apps. Once NITRO Studio is installed, open the NITRO studio to finish the installation process and then you can activate NITRO in sites or install the pre-built NITRO applications in the site collection. After installing the NITRO Studio in the site collection, go to the site contents page of the root site. Click NITRO Studio App to open the main page of NITRO Studio. If NITRO framework app is not yet installed then this page will show a message for the same. Once framework app is installed you can finish the NITRO installation process. Please use the tenant level App Catalog site to add the Crow Canyon Add-ins. Extract the .app file from the downloaded zip file from the Package Information above. 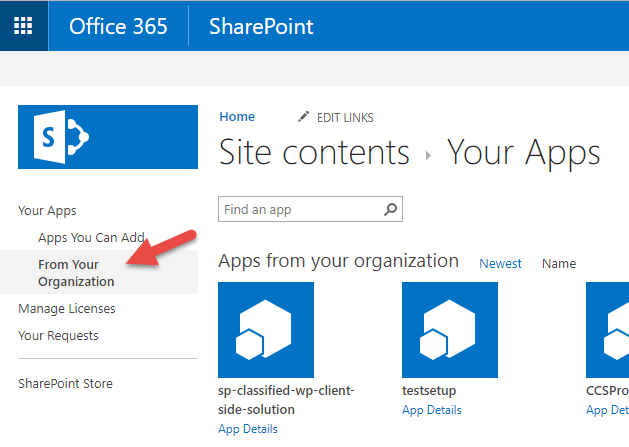 Upload the CrowCanyon.NITROFrameworkEx.app file to ‘Apps for SharePoint’ as shown below. 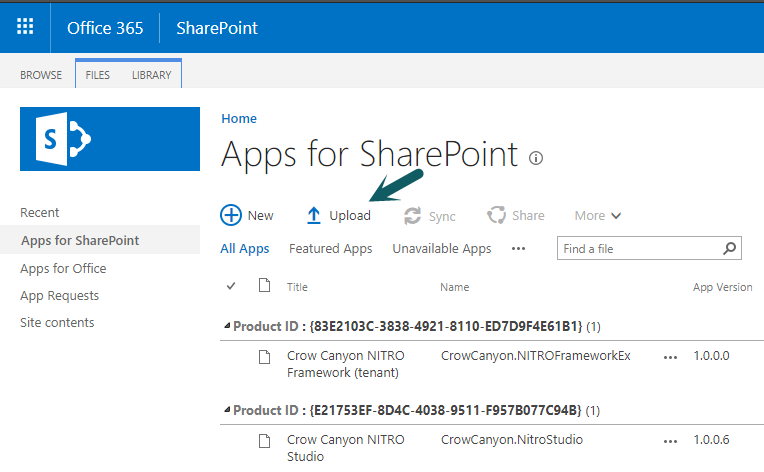 Note: Crow Canyon NITRO Studio app is not required to be uploaded in catalog as it can be directly installed from the SharePoint App Store. Please ensure that the App is added to the App Catalog as per above step. Also, the site collection where you want to install NITRO should be created, and you should have Site Collection Administrator privileges on the site collection. After that, follow the below steps. 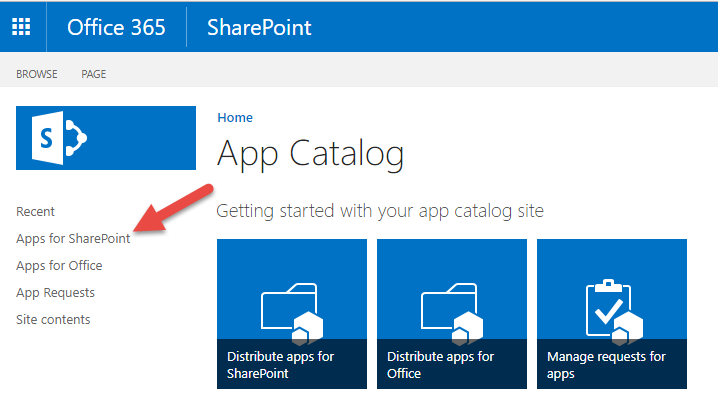 This app is available in the SharePoint App Store and will be installed from there. 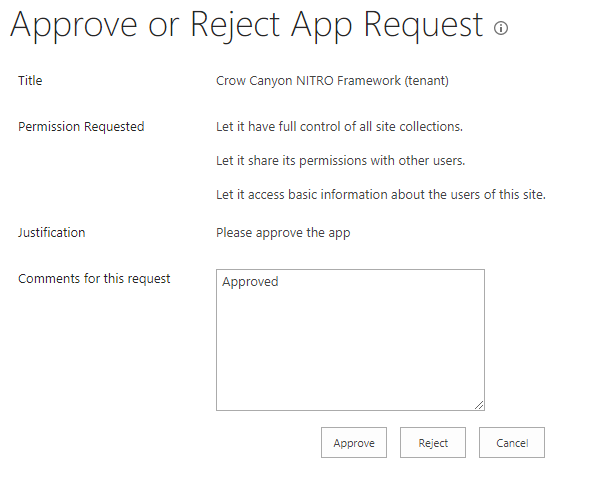 Once the tenant Admin approves the app, go to Site Collection and add the Crow Canyon NITRO Framework (tenant) App to the Site Collection. 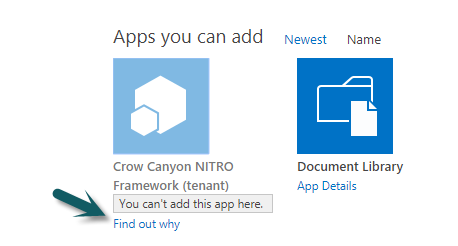 Go to Site Contents –> add an app –> From Your Organization –> Add Crow Canyon NITRO Framework (tenant) App. Please contact Crow Canyon support in case you face any difficulty in NITRO studio installation. If you have installed the NITRO in Site Collection, please refer this Article to activate the NITRO for a sub site and to install the prebuilt Crow Canyon NITRO applications.